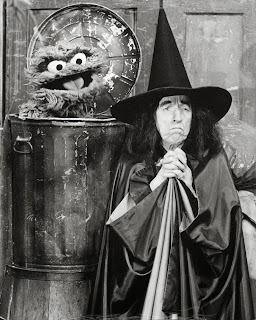 After Halloween, a photograph of Margaret Hamilton, in the dress of the character which made her famous and likely immortal, with Oscar the Grouch on Seasame Street came to my attention. Forever a fan of the witch, and Margaret's incarnation of the green, slipper-stealing role-- and of Jim Henson's mupperty-- I clicked over to YouTube faster than you can say "I'll get you my--"
And found nothing. After the fifth and sixth combination of "Margaret Hamilton Seasame Street" in my YouTube search bar, I realized something was suspect. Probably some copyright issue, I thought. Wrong. Clips of Margaret Hamilton, in character as the Witch of the West from the Wizard of Oz, on Seasame Street are unavailable not because of some copyrigtht issue, but because the episode-- having been deemed too scary for children-- has not re-aired or been seen since its premiere in 1976. "The Wicked Witch responds by making it rain inside [Mr.] Hooper's Store and even threatens to turn Big Bird into a feather duster and David into a basketball. Only Oscar the Grouch initially admires her and suspects he may even have a crush on the witch. The remainder of the episode's street scenes follow the witch's attempts to retrieve the broom, including disguising herself as a harmless old lady. Big Bird grows to like her, and is, saddened when the witch departs, but she drops the broom yet again." After reaction that included letters from parents complaining that Margaret's Witch was too scary for their children-- and a response from a Wiccan who equated the Oz character with their religion-- it was decided the show would never be re-run. And to the Internet's knowledge, it never has. What a loss, what a loss. What a world, what a world. For some consolation that-- at least for now-- you are not able to watch Oscar the Grouch fawning over the Witch of the West, watch this later appearance by Hamilton, dressing in character on a popular children's television program which caused far less hysteria; when Mr. Rodgers welcomed the Witch to the neighborhood.